A gateway to East Tennessee, Knoxville McGhee Tyson Airport (TYS) is a popular airport due to its proximity to the famous country music city of Knoxville. Located within Blounty County and close to Alcoa, Green Meadow, Maryville and Rockford, McGhee Tyson Airport is also a prominent gateway into the exclusive tourist resort of Gatlinburg, the entrance to the spectacular Great Smoky Mountains National Park. Knoxville Airport is the premier air facility in the whole of East Tennessee and serves almost two million passengers on a yearly basis, handling a mixture of cargo and civil flights. Currently the airport directly employs a staff of round 150, features two parallel runways both measuring 2,740 metres / 9,000 feet, and covers approximately 2,000 acres / 800 hectares. The facility is managed by the MKAA (Metropolitan Knoxville Airport Authority), a non-profit organisation founded in the late 1970s. Visitors can choose between local buses, commercial and courtesy shuttles, taxis and limousines for travel between McGhee Tyson Airport and destinations in and around Knoxville. These include the World's Fair Park area and also the nearby University of Tennessee (UT), home to around 26,000 students. All the main car rental agencies have booths at the airport and fleets on standby, linking Knoxville's Airport with surrounding towns and cities, such as Atlanta, Chattanooga and Greenville. 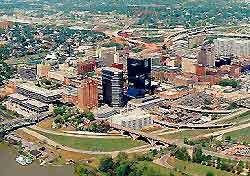 Knoxville was once the territorial capital and is today famed for its connections with country music and rodeos. The city also has an excellent zoo, some great performing arts and sporting venues, as well as several quality museums and galleries, such as the science-related East Tennessee Discovery Center and the acclaimed Women's Basketball Hall of Fame. The east Tennessee area has plenty of great day or overnight trip options, with favorite destinations being Gatlinburg and the Great Smoky Mountains National Park. In Knoxville, the accommodation scene is rather dominated by popular chain hotels, with the cheapest lining stretches of the I-40 Interstate. For an altogether more tranquil experience, consider staying in one of the nearby Pigeon Forge cabins, which are just a relatively short drive away and often boast stunning mountainous backdrops. Many visitors flying into McGhee Tyson Airport (TYS) immediately head straight to the nearby Dixie Stampede and enormous Dollywood theme park. Located in Pigeon Forge, next to the Great Smoky Mountains and to the southeast of Knoxville, Dollywood is full of roller coasters, fast rides, a working steam train and even occasional appearances from Dolly Parton, the park's amiable owner.